Pictured above is one of the boats used in the survey. 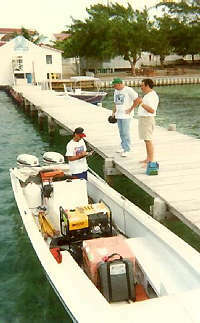 BEL San Pedro Manager Ernesto Gomez (in short pants) is on the dock, John Balderamos of BEL is in the boat. Belize Electricity Limited (BEL), in their continual effort to bring better electricity service to the country, established their 1st Power Development Project in which power stations throughout the country were updated, one of which was San Pedro's power plant. In addition, the Mollejon Hydro-electric plant was implemented into BEL's power supply. In their 2nd Power Development Project BEL has contracted Alcatel Cable, a French worldwide company, to provide and install a 34.5 kv submarine power cable between the mainland area, "Bomba" near Maskall Village, to Ambergris Caye near "Boca Chica." The cable will link San Pedro to the rest of the country and will supply electricity to the island. The diesel powered plants now being used will be obsolete in the coming year. Prior to the manufacturing of the cable, a survey had to be performed in order to determine the exact cable length and certain environmental parameters and characteristics. For this purpose Alcatel contracted a French specialized company ISM -Fugro, to perform the survey from May 26th to June 12th, 1997. Fugro personnel for the project were Kenny Dykes and Don Rose; they were accompanied by John Balderamos of BEL and Marc Denner of Alcatel. The job consisted of recording all the main environmental features in a 250m wide corridor which stretches from Bomba to Boca Chica. This involved recording water depths, sub-bottom morphology and nature of soils, sea bed features and the general location of these characteristics were pinpointed with the help of a differential positioning system. The equipment used for the job was brought from France and was returned after the completion of the survey. The team rented the Samy Jess for their expedition through the deeper portions of the corridor and used a smaller speed boat for the shallow mangrove areas along the coast near Bomba. Four main pieces of equipment used for the survey were: the Sub-bottom Profiler which reported the different soil layers within the corridor (morphology), the echo-sounder reported on the water depth of the corridor, the side scan sonar reported any seabed features such as sea grass or any hazardous elements such as wrecks and the Differential Global Positioning System (DGPS) provided the exact location of all these characteristic. The survey phase of the project has been completed and now the cable route must be established, the actual cable size determined and then the manufacturing of the cable will take place in France at one of Alcatel's factories. When the power cable is complete and ready for installation it will be loaded on to a barge and then laid out according to the established route. Part of the cable will be buried, part will lay on the sea floor and part will be protected by cable protectors. This is to ensure that the sections of the cable that lie in areas that are heavily trafficked by boats and barges will not be damaged. Alcatel cables have a 30 to 40 year life span but according to Marc Denner, "Many of the power cable over the world that we've installed 40 years ago are still working well." It is estimated that the cable will be ready for installation in February of 1998. "We will also be manufacturing the terminal poles which will connect the overhead lines in Bomba to the submarine cable." According to John Balderamos of BEL, the new project is environmentally friendly and the supply of electricity will be more efficient and reliable. "San Pedro has 4 feeders, two for the town, one for San Pablo and one for the northern area of the island. Those plants run on diesel and it is very hazardous bringing in barges of diesel to the island. What happens if there is a storm? If there was a spill it would be devastating to the reef, the environment and the island as a whole." The present electricity plant in San Pedro Town cannot accommodate the voltage that will be received from the mainland, therefore, a new sub-station will be built behind the existing plant. This sub-station will break down the voltage so that the cable can feed adequate voltage to the existing distribution system. The sub-station will be built by Markham Electric International, a Canadian company, and is expected to be completed around the same time as the power cable.